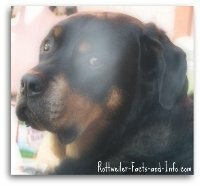 Rottweiler Weight - How much should your dog weigh? Don't be taken in by those big brown eyes! Rottweiler weight is important - Don't be fooled by those eyes, they can be so manipulative. 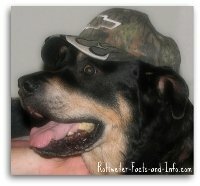 On of the best things you can do to prevent Rottweiler health problems is to keep your dogs weight at a healthy level. Just like the Rottweiler growth chart, your Rottweiler's weight is not one size fits all. Under weight is always better than over weight, but when I say under weight, I don’t mean under-nourished. My Savannah girl was actually fairly large for a female, but my husband and I made the huge mistake of letting her get down right fat! I really didn’t realize how fat she had gotten until I noticed that she couldn’t actually clean her girl parts properly – Yikes, we promptly put her on a diet. 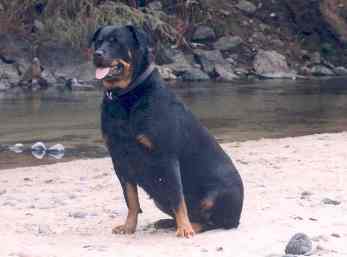 Savannah's excess Rottweiler weight was probably a big contributing factor to her rupturing a disc in her back, which is what paralyzed her and how we lost her at only 7 years old. Here’s a picture of my little pudgy ball when she was still pretty fat. 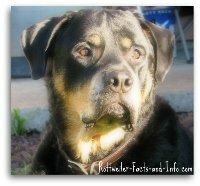 All dogs should be kept at a healthy weight, but especially large breeds like the Rottweiler. Excess weight not only puts extra strain on muscles like the heart, but especially on the joints and bones. You should always be able to feel your Rotties ribs easily. If you have to push through a layer of fat, she definitely has excess Rottweiler weight. You should also be able to see the contours of his body for the most part, like the picture of Moose below. Exercise of course plays a big part in a Rottweilers weight, so you need to make sure that you’re feeding your dog based on the amount of exercise that she’s getting. 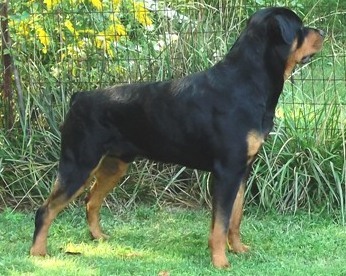 My male Rottweiler Chevy and I are very active in the summer time, because the weather’s good. We go for walks every day, throw the ball constantly and do a lot of swimming at local lakes. On the other hand, when winter comes and we become more couch potato’ish, I cut back on his food accordingly. I have done a much better job with keeping him at a healthy weight than I did with my girl. If you’re at all unsure about your Rottie’s weight, then don’t be afraid to ask your vet, or even contact a reputable breeder in your area.